Be the first to share your favorite memory, photo or story of Ester. This memorial page is dedicated for family, friends and future generations to celebrate the life of their loved one. Ester Davis, 86, of Brooklyn, passed away at Canon Hospice in Gulfport. Funeral services will be held at 11:30 a.m. Saturday, March 23, 2019 at Little Black Creek Baptist Church with interment in Lumberton City Cemetery to follow. Ester was a member of the Little Black Creek Baptist Church. She was a homemaker who was a devoted mother and grandmother and enjoyed doing needlepoint. She is preceded in death by her husband, James Andy Davis; her parents, Willie and Lottie Kay Perry; and twelve brothers and sisters. She is survived by a son, Andy Davis of Brooklyn; five daughters, Sharon (Cecil) Thompson of Lumberton, Melinda Walters of Wiggins, Betty Ann Daughdrill of Brooklyn, Jane (Eddie) Ladner of Linen, NC, Kate (Jessie) Burdine of Gulfport; eight grandchildren, eight great-grandchildren, and three great-great-grandchildren. 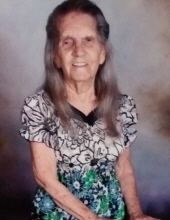 Visitation for Ester will be 9:30 a.m. until service time Saturday, March 23, 2019 at the Little Black Creek Baptist Church. To send flowers or a remembrance gift to the family of Ester Jenell Davis, please visit our Tribute Store. "Email Address" would like to share the life celebration of Ester Jenell Davis. Click on the "link" to go to share a favorite memory or leave a condolence message for the family.